So far nothing huge! I hope that continues. The thing that did creep up, however, is hand pinching. This is something she did from a baby on up to about age five for self-soothing. We noticed at her first soccer practice, she started doing it again. 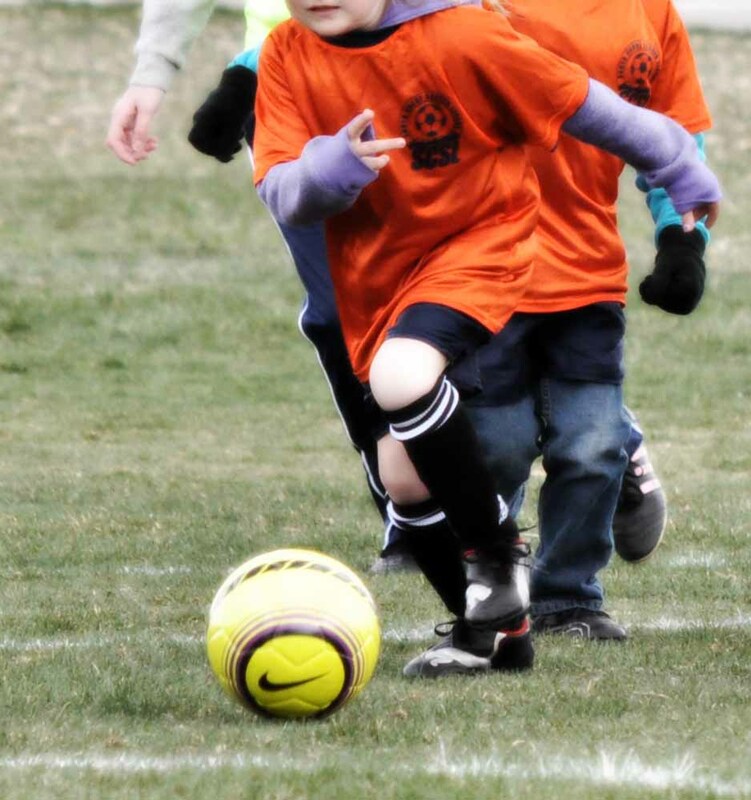 Kaitlyn is playing soccer and enjoying it. She is good at anticipating where the ball will go to rather than just chasing where it is going. She is not aggressive at all nor is she a hard kicker–she sometimes looks more like she is extending her leg to do a ballet toe point than kicking. EDIT–after I wrote this, Kaitlyn really took off and started kicking quite hard. She really enjoys it and she gets to run around with her friends. It is a fun age to watch. They are young enough they still make the cute little mistakes but old enough they do some real playing. This has always been and continues to be our biggest difficulty with her. We just do our best to make sure she eats a balanced diet. If it were left to her, she would eat saltines, cheese, pepperoni, peas, apples, and white bread. Sleeping is going really well. Having Kaitlyn and Brayden share is super easy. So easy I forget I even have room sharers. I have to wonder if part of the ease is that they are in bunk beds. I have to imagine that makes it easier. They can’t look at each other once they are in bed. I am sure there are children who would not let that deter them (like, um, McKenna), but I think it is helpful. I do think no matter the bed situation, Brayden and Kaitlyn would be fine. Kaitlyn still loves art best of all. We had an Evening of the Arts at school (the PTO version of Reflections). She just loved doing art projects and turning them in, and she even got grand prize in the categories she entered. The Kindertude is gone! Hurray! School is going really well! Her teacher is great and gives her some extra things to do so she can be a bit more challenged. Kaitlyn is still taking piano and really enjoys it. She is also in dance and loves to dance. She and McKenna put on their dance shoes and put on shows for me all of the time. Girls are so different from boys! I agree about the soccer at this age and even a year older. The kids are so cute – they play a "real game" but they are still young and make mistakes.We started our boys sharing a room a couple months ago when they were an old 6 and an old 3. It worked without a hitch! They have a bunk bed. We knew it wouldn't work before that age, though. Also, it might not have worked at those ages if our boys' ages were reversed because their personalities are different.